The set combines the Cleansing Oil and the Nourishing Cream. These two products make a perfect match and are among the most popular cosmetics chosen by our customers. The oil cleanses and takes care of your skin and the cream nourishes it and provides with all it needs to be healthy and naturally beautiful. The set includes the Cleansing Oil and the Nourishing Cream. It is a perfect combination for you if you want to regulate, calm down and efficiently care for face skin. 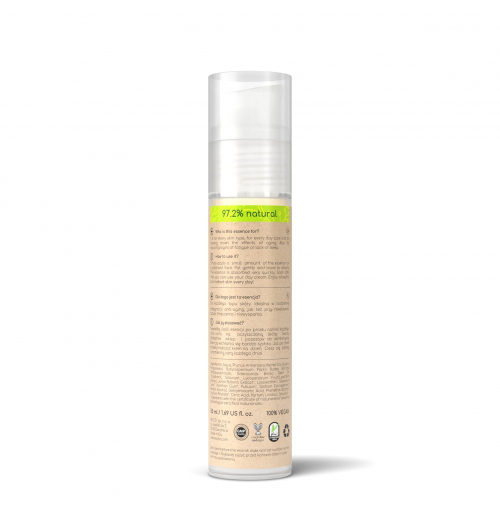 Resibo Cleansing Oil cleanses face thoroughly, but gently. Why? Because the oils are best solvents for oils, like sebum, and for make up products and other impurities. The special fibre of the cloth included absorbs the impurities and removes them. Why oil cleansing is so effective? First of all, it’s a very gentle process. You don’t have to rub or pull your skin – and that’s what your skin hates. Second, impurities on the face are composed mainly of fats mixed with your sebum produced by your skin. Fats are best dissolved by fats. And oil is a fat. Resibo Nourishing cream is enriched with ingredients that regenerate epidermis, perfectly nourishes the skin and smoothes wrinkles. It contains cyanobacteria extract that acts as a natural retinoid, smoothes and thickens the skin. The anti-aging property of cyanobacteria is complemented by other effective concentrates: Brazilian nut oil, apricot kernel oil and tomato extract rich in lycopene. All together they provide vitamins, aminoacids and substances responsible for firm and fresh-looking skin. The formula is complemented with moisturising ingredients: hyaluronic acid, AquaxtremTM and cold pressed oils. Apply the oil on dry or damp face and massage gently, just like when you use a face cleansing gel. Then use the included microfibre cloth, damp with warm water. Pat your face gently with the cloth, trying not to pull your skin. the cloth is reusable; it can be easily washed with warm soapy water. Please remember that natural oils are the best choice if you need a gentle, healthy and efficient cleansing method.